You can access all reports generated for a limited time frame — from the last hour, today, yesterday, and older. You can also regenerate previously run reports, change the date range, or change their output format. To see recently generated reports, go to Reports > Reports > Recent and saved. 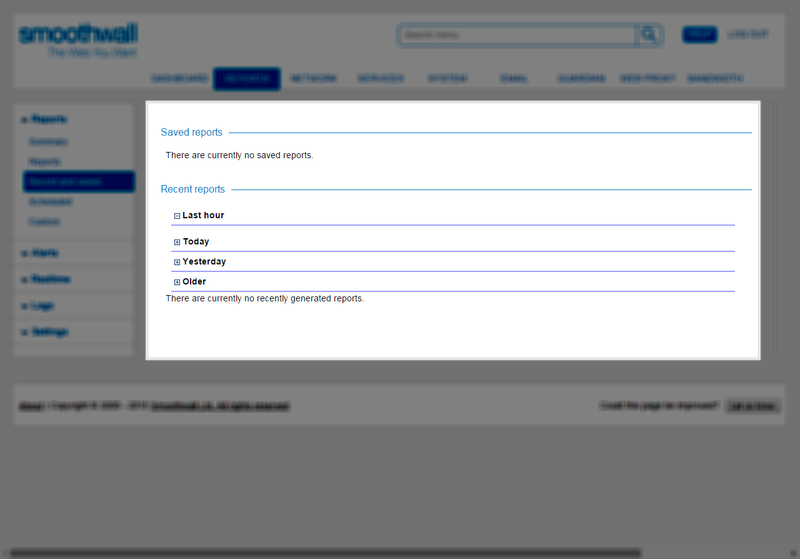 You can also save generated reports for permanent access. 1. Generate a report as detailed in Generating Reports. 2. When the report has generated to screen, enter a name for the report in the Save as text box at the top. The report appears under Reports > Reports > Recent and saved in the Saved reports panel. 1. Go to Reports > Reports > Recent and saved. 2. Locate the relevant report. 4. If required, you can choose to password-protect the link. Users who have the shared URL are prompted to enter this password before they can view the generated report. 6. From the Share report - <report_name> window, click Copy. 8. Paste the report details to the required share medium, for example, email. You can only delete recently generated, saved, and custom reports. Supplied reports cannot be removed from the Smoothwall. Note: Only custom reports you have created can be deleted. Supplied report templates cannot be deleted. 1. Go to Reports > Reports > Reports. 2. Click the button for the relevant report.